An animal welfare group has set up traps and surveillance cameras after receiving several reports of a cougar or puma being seen in parts of Co Cork over the past fortnight. Vincent Cashman of the Cork Society for the Prevention of Cruelty to Animalssaid the reports they had received of a cougar being seen near Fountainstownand Crosshaven had yet to be confirmed. However he said that while the sightings were “out of the ordinary but not impossible”, the CSPCA felt that they had to give them credence such was the adamant belief of those who contacted them. 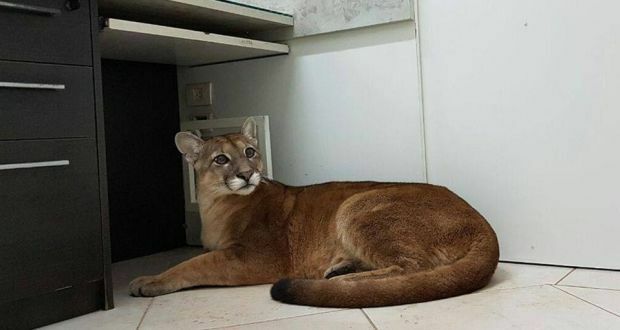 Speaking on the Neil Prendeville Show on Cork’s Red FM, Mr Cashman said it was possible that a cougar or puma had been brought into Ireland illegally as a pet and escaped from its owner. Mr Cashman said cougars are solitary animals and tend not to confront people and while they had received no reports of any sheep being attacked, cougars could live off smaller animals like rabbits. Male cougars can roam over areas of up to 300 square miles while females can cover areas of up to 200 square miles but the CSPCA had targeted the locations of reported sightings to set up cameras. Mr Cashman said that the CSPCA was continuing to monitor the trail cameras and ultimately hoped to trap the animal and establish what exact species it was, but that could take some time. “When the myxo dies off a little bit, and the rabbit population normalises, then he may find getting food a little bit harder and so he may be encouraged towards our traps,” said Mr Cashman. Gardaí in Togher, with responsibility for the Crosshaven and Fountainstown areas, said that they had received no reports of cougars being seen in the area or any reports of cougars going missing. The nearest wildlife park to Crosshaven and Fountainstown is Fota Wildlife Park on the other side of Cork Harbour but Fota does not have cougars. It does keep lions, tigers and cheetahs. There have been numerous reports of large cats being seen in the wild throughout Ireland in recent years, with several reports of pumas or panthers being seen in various parts of Northern Ireland. In June 2017, the PSNI posted a warning on its Facebook page about sightings of a possible panther in the Newry area and urged people not to approach the animal if they saw it. The PSNI and the Ulster Society for the Prevention of Cruelty to Animals began hunting for a suspected puma in August 2003 after a large animal killed a pedigree ram on a farm in Co Antrim. According to Stephen Philpott of the USPCA, there were also sightings of wild cats around the same time in Derry and Tyrone, where a newborn calf was killed on a farm near Cookstown. This entry was posted in Animal Rights and tagged cougar, cruelty by Exposing the Big Game. Bookmark the permalink.